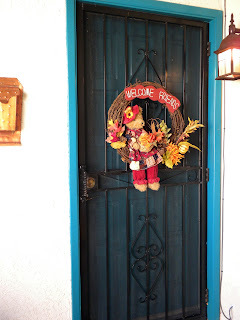 I just have to share some "pretties" that I found yesterday when I was out checking some of my favorite haunts & then this morning as I shopped for groceries. First the goodies from yesterday. The 2 rooster plates ($3.99 & $2.99) & the cute little artsy rooster ($3.99) are from Ross's, the green pitcher ($5.99) is from Marshall's, the earthy brown planter/urn ($4.99) is from Joanne's, & I already had the matching bird from Michaels (on sale for less than $2). This little guy just cracks me up. I absolutely love the colors. I was so surprised to find these plates. The colors are so bright & clear & they were so cheap! 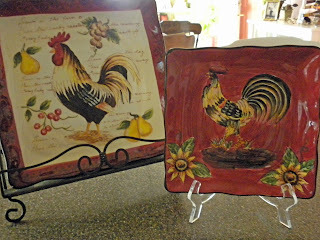 I have to confess that the chicken/rooster-thing is new to me, but seeing them on so many blogs had peeked my interest. I guess now I'm officially hooked & have started a collection. So with that in mind, my trip to Walmart this morning for "groceries" garnered a couple more things. 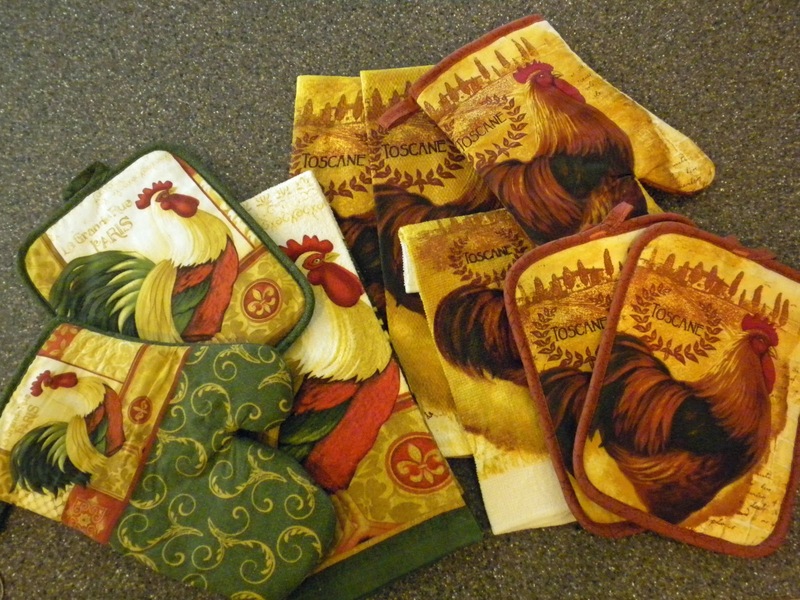 I've been gradually replacing some old & well-worn kitchen textiles; so when I found these, I had to have them. I love both sets, but the earthy colors are my favs. 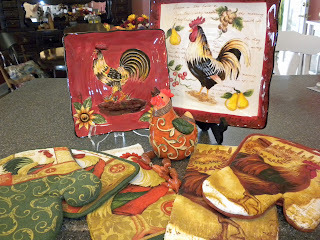 I can see mixing the green/red set with some of my Christmas items. 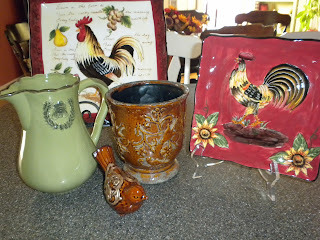 Okay, this is my start-up collection of roostery-stuff! I'm thinking this is going to be fun. 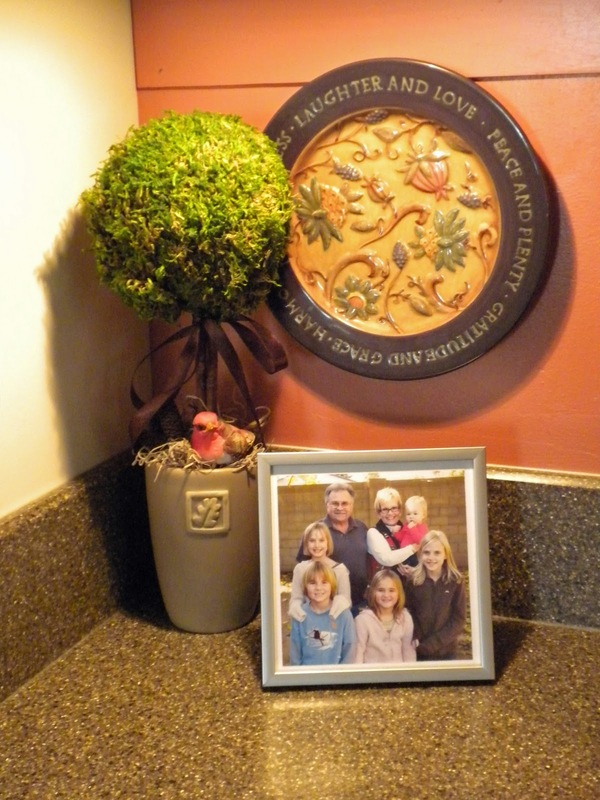 Had to do a bit of re-arranging of some vignettes in my kitchen to incorporate my newfound collection pieces. What do you think? This is my island re-do. I love this plate. 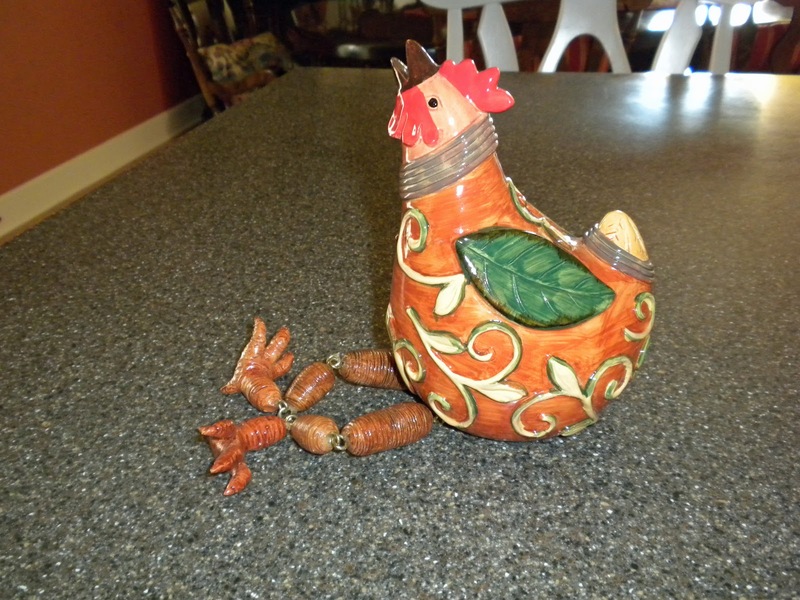 It's called "Fruity Rooster!" FYI, this layered candle is also from Walmart -- Mulled Cider/Cinnamon Sticks/Golden Apple -- & it smells incredibly good! I made a couple of other purchases yesterday, but they are Christmas-related & I'm not ready to show any Christmas decor yet. That doesn't mean I won't be buying items when I see them for good prices. That would be borderline irresponsible, wouldn't it? Ya'll have a great weekend & stop back again soon. Have I shown you this? 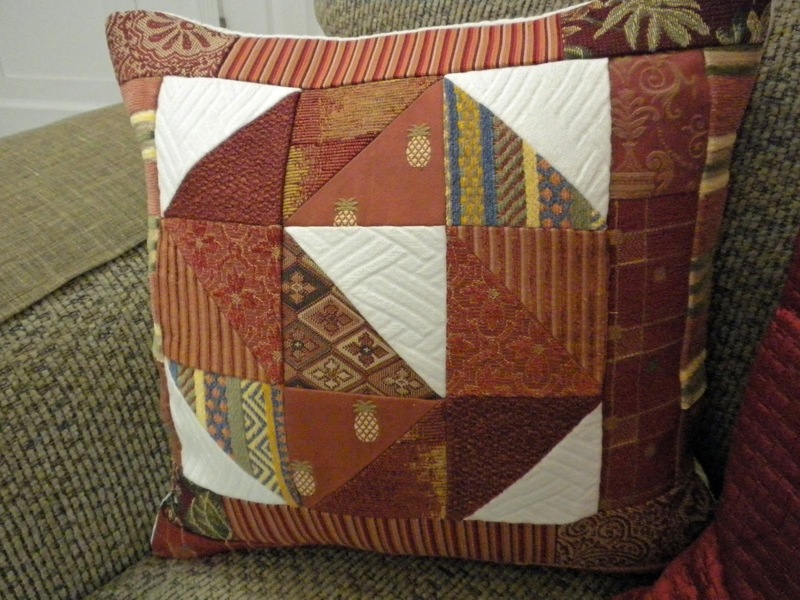 If you are here for this link party, you'll have to go about halfway through this post to get to the fabric items -- my pillows. 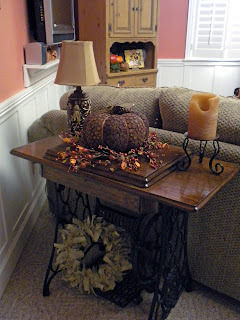 Oh, I almost forgot, in the 3rd pic you'll see a wreath under the sewing machine. 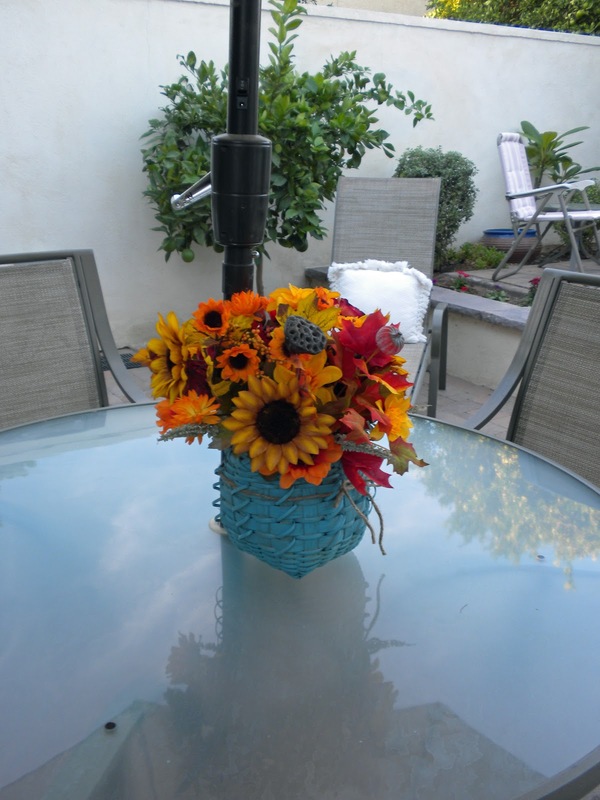 I made that out of burlap. Just cut strips & tied them on a styro wreath. 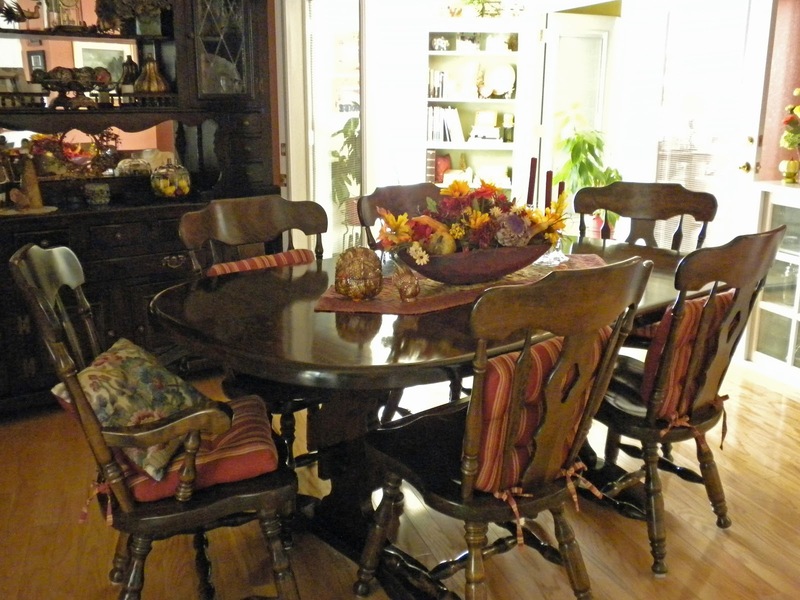 I think you've probably seen parts of this room, as in a couple of tablescapes, but realized I had never actually shown the entire room. I'm talking about my living room. As I've shared before, we live in a townhouse, and it isn't very large. 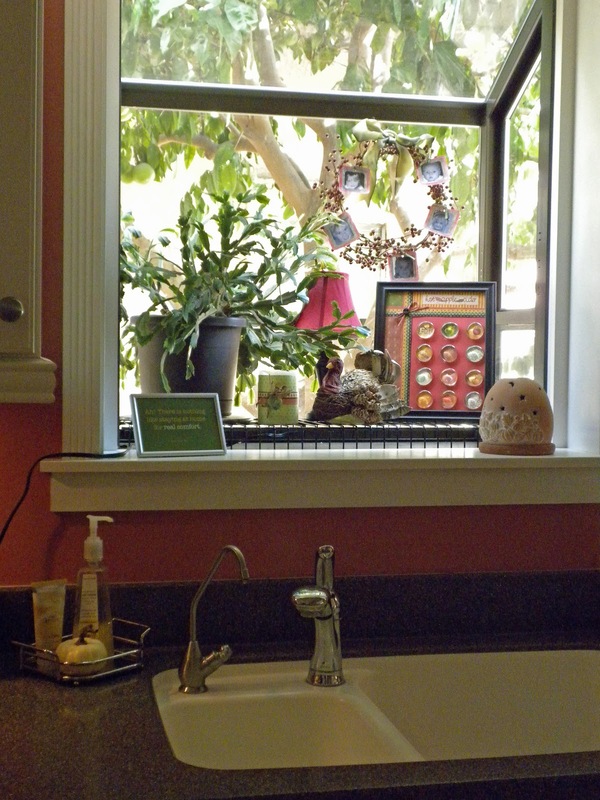 We utilize every room in our home. There is no foyer and the entryway opens right into the living room, but we used tile to designate a small entry and walkway to the rest of the house. The living room is our main living/media area. 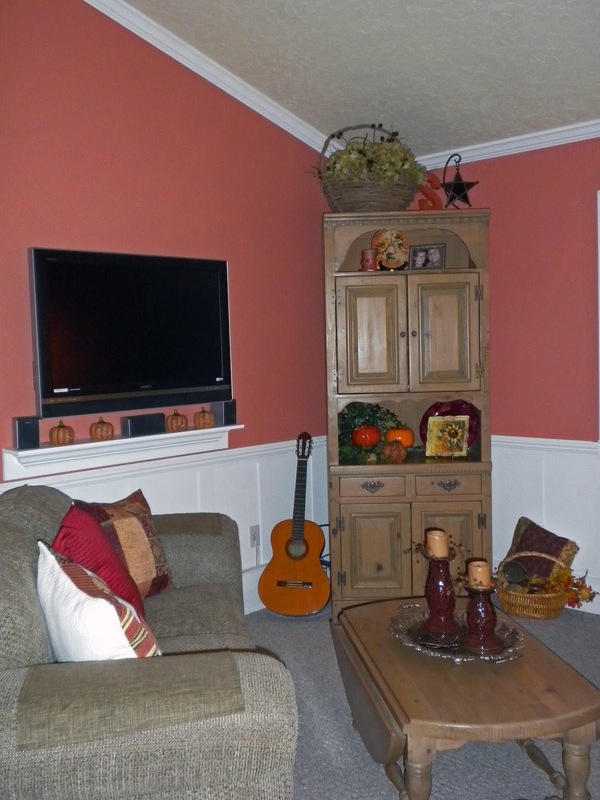 This is where we have our flat screen & stereo equipment. This is where The Man put in surround sound, added wainscoting, a two-wall display shelf to break up the vaulted ceiling, & crown molding. 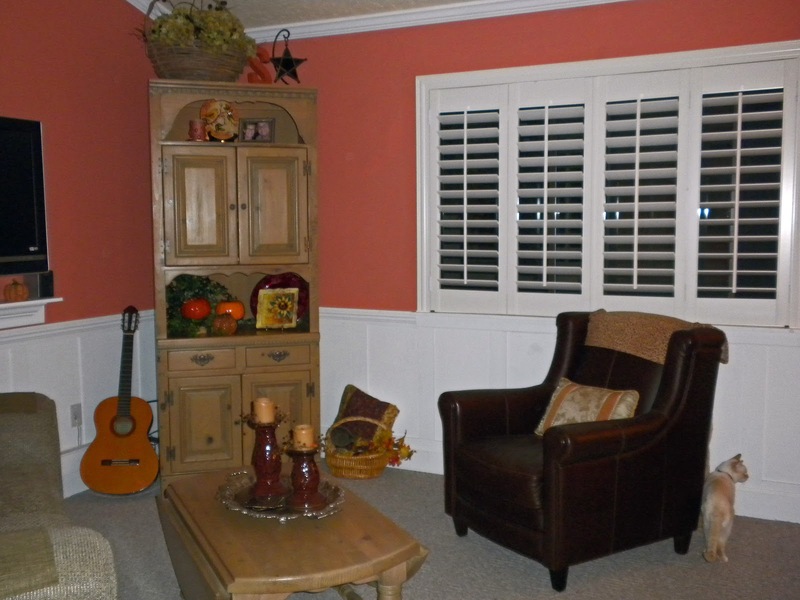 This room has really comfy furniture where we spend every evening reading &/or watching our favorite TV shows. This room is easy to mess up with newspapers, magazines & whatever knitting/crochet project I might be working on, but it's also super easy to tidy up. 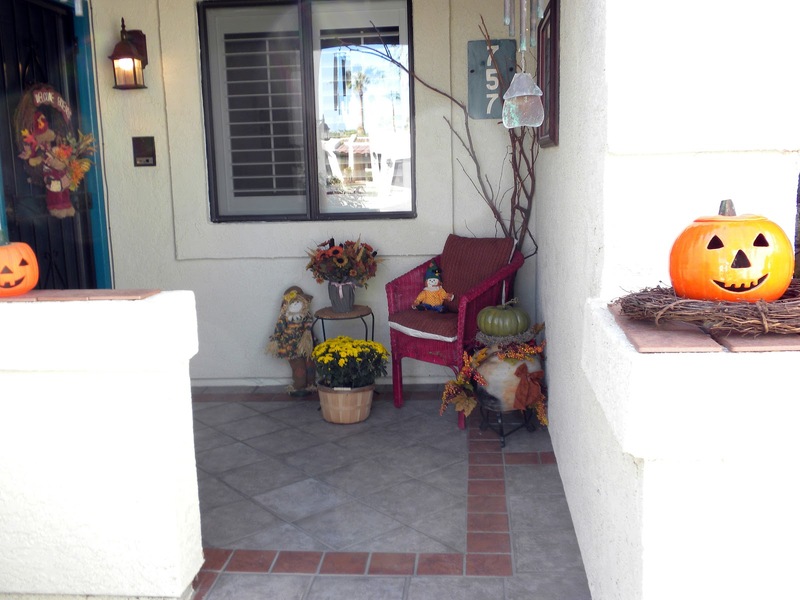 I'll start the tour at our little covered front porch area. 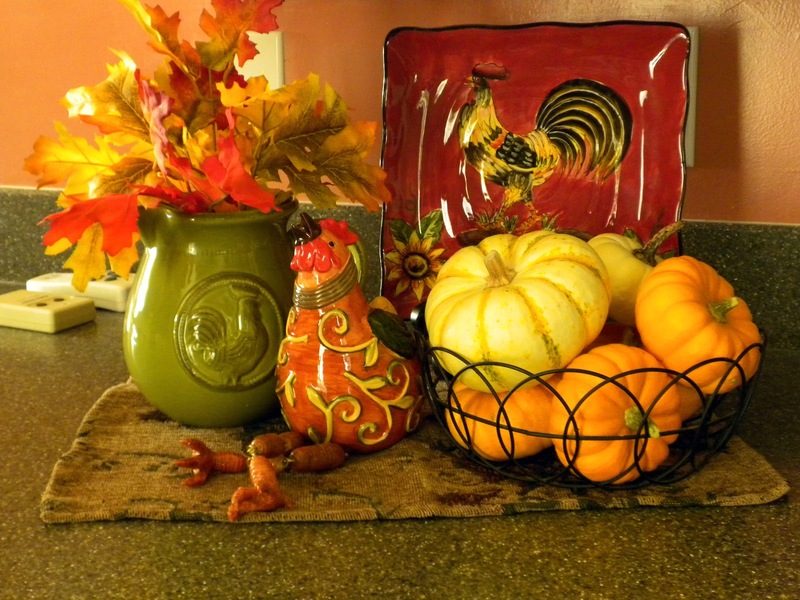 I love making this pretty for every season. 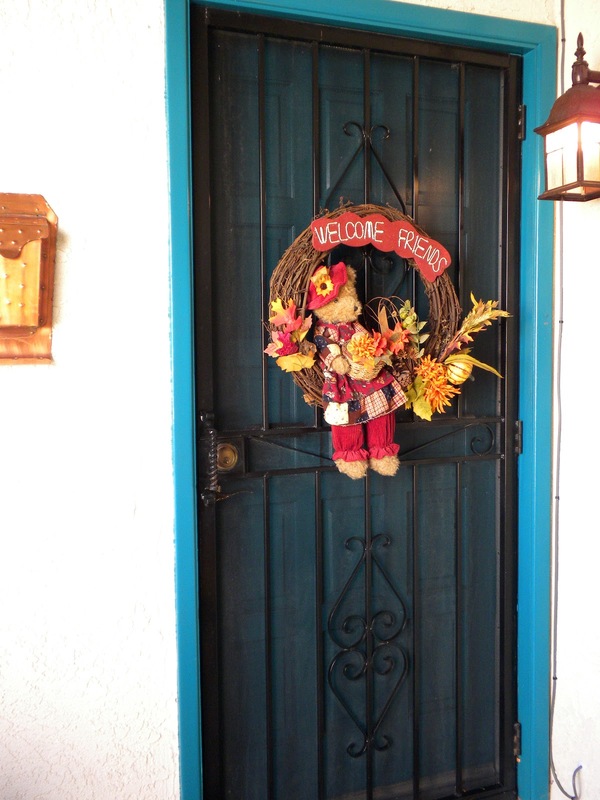 I almost always have some kind of wreath or swag-type thing on the door. This is what passes as an entry. I've used my antique singer in this spot for a long time. 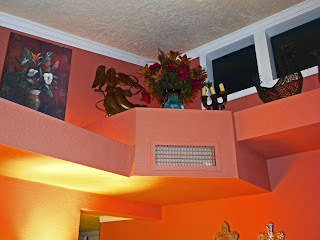 I really like things on angles, so you see that a lot in our home. 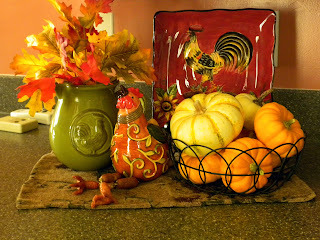 This is another spot where I always have some seasonal display. Panning around the room clockwise, this is a very Tuscan print from Kirkland's. 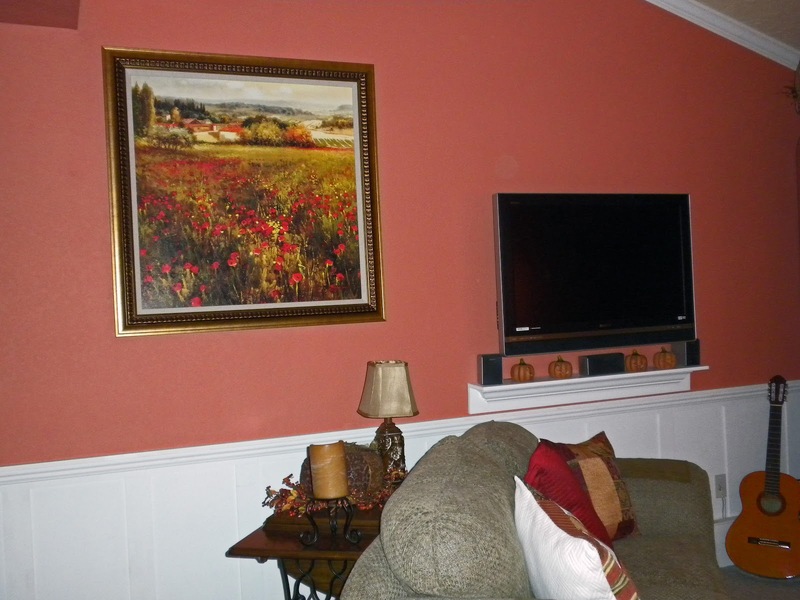 The flat-screen was a dickens to get mounted on the wall, but we truly enjoy it. 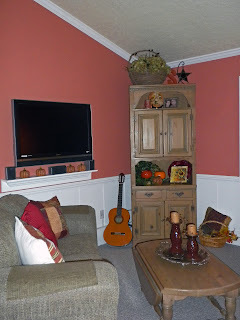 The tall pine cabinet in the corner houses our media equipment & also provides more spaces for me to decorate. In case you are wondering, the guitar is mine. A bunch of years ago I was a "wannabe" Country/Western singer, but I couldn't sing & I couldn't play, sooo....! The grandkids like to "strum" on it now & again. Anyway, the cabinet & the coffee table used to be very dark pine (like my dining room furniture), but we managed to get them stripped & stained with a very soft golden stain that really enhanced the knots & grain of the pine. 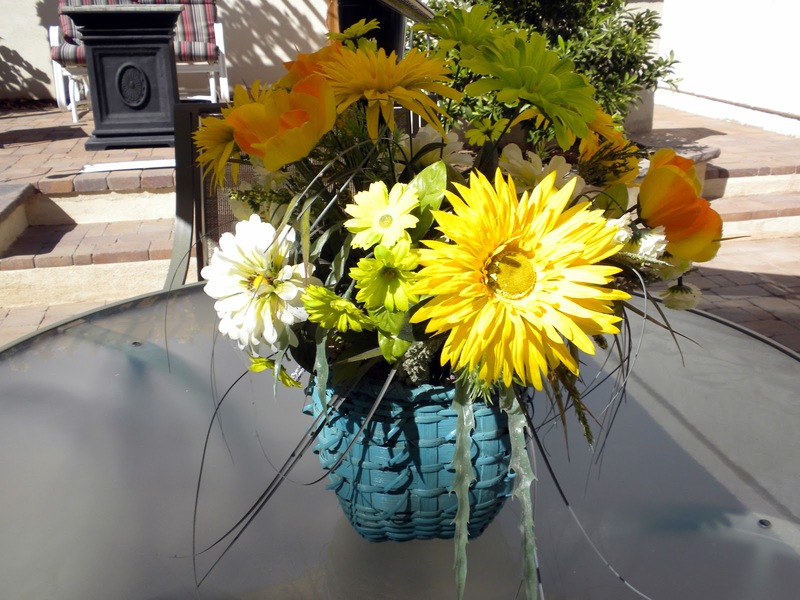 They also are much easier to take care of in our dusty desert climate. This is a very comfortable leather chair, and Abby likes to sit on the back & look out the window. She's chirping at me right now to open the shutters so she can get in the window. It matters not that it's still dark outside & the birds aren't even awake yet! This is The Man's end of the sofa. I try to keep things fairly clean on his side table, because he's just not into being careful where he puts his books or newspapers. 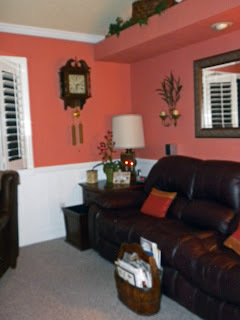 The clock is about 35 years old & we bought it new. It's rather Early American, as is all the pine furniture in our home, but it has a lovely chime so it stays forever. 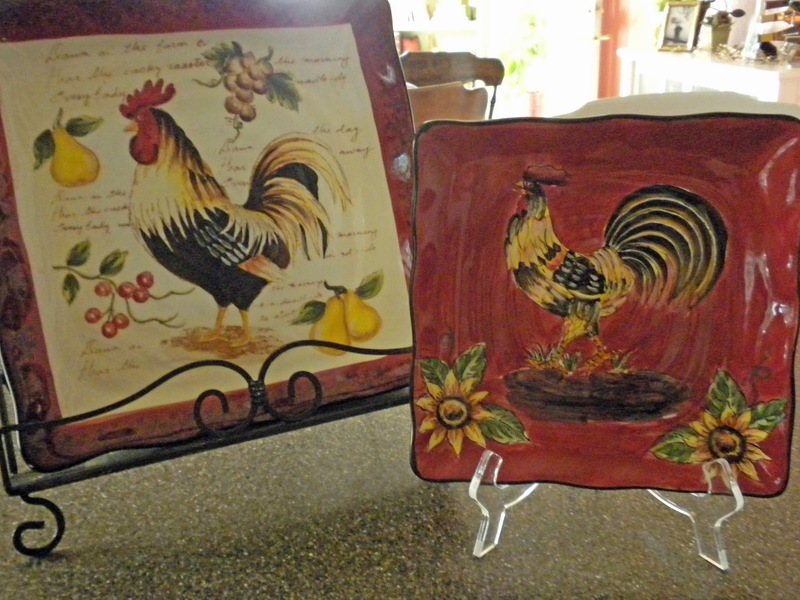 The magazine holder is a Chinese market carrier that we found in San Francisco a few years ago. We liked the size & the dark stain. This is my end of the sofa, note all the chotskies on my table. The large mirror is another Kirkland's purchase & the matching candle wall sconces (all metal work) are from a boutique in Phoenix. Abby has apparently grown tired of waiting for me to open the shutters. 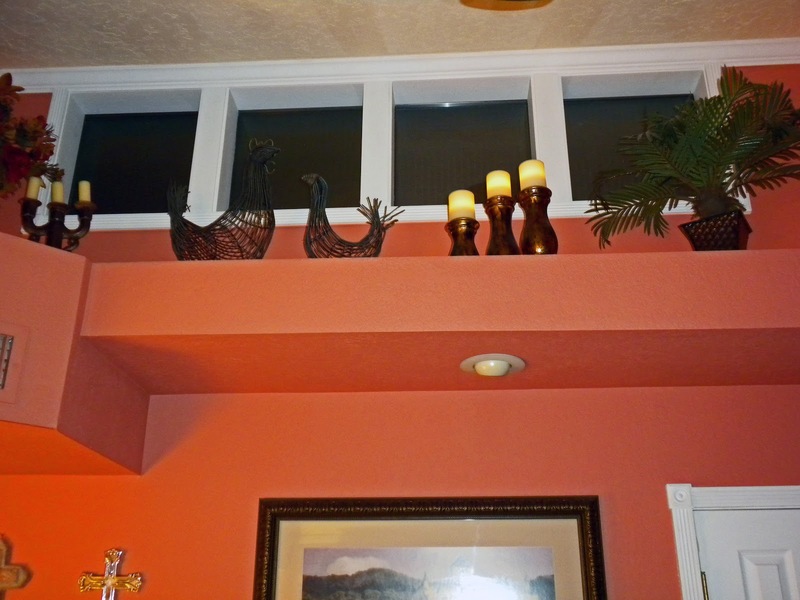 The next 3 photos show the display shelf that The Man added. 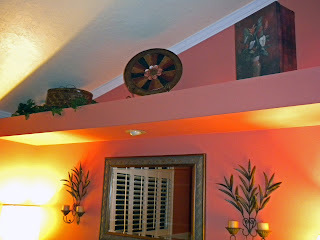 You can also see the crown molding that he painstakingly put up. He put outlets on this shelf so we could have lighting, he just hadn't considered that I would want a lamp up there. Yet another Kirkland's buy. 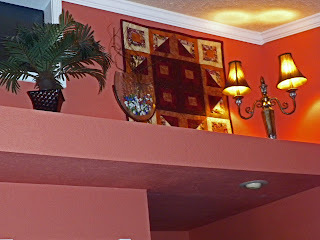 The wall-hanging was one of my first efforts at quilting. These four little windows cause me much consternation when I'm trying to take pictures during the daytime. That's why I was snapping away at 5:30 a.m. one day. 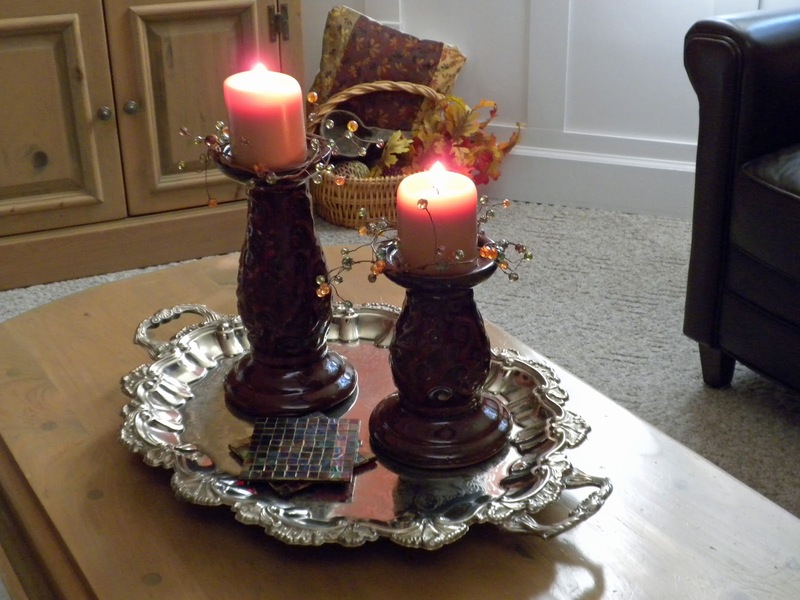 The set of candles are battery powered with a remote. The Man saw "remote" & thought it was an excellent idea to get these. What is it with men & remotes? 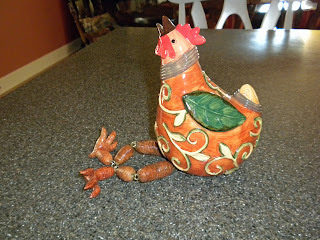 It's hard to see them, but the 2 chickens are made with wire that looks like wood. The Man did this 2-level design with the angled corner to fix a poor air-conditioning duct layout. This room used to be really warm, because the air-vent came straight out from the original wall & flowed right to the front door area. Great planning by the original builder, right? And, yes I know we need to paint the interior grill of the vent. "Oh, The Man, I have a little honey-do job for you!" Almost forgot about the angel. This was an after Christmas sale item at Michael's many years ago. It has been a very bright gold color until just recently when I painted it a dark rich copper. Much better. This end of the shelf isn't too exciting, but it's okay & I really like that this whole display area is here. We are the only home in the neighborhood with this & it always garners a lot of attention. 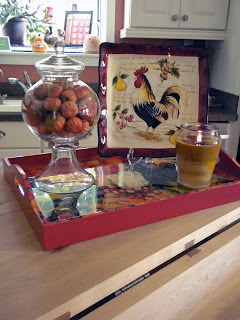 Just a little close-up of my very simple coffee table display. The silver tray isn't old, but it looks old. Love these very chunky candle holders from Pier 1. 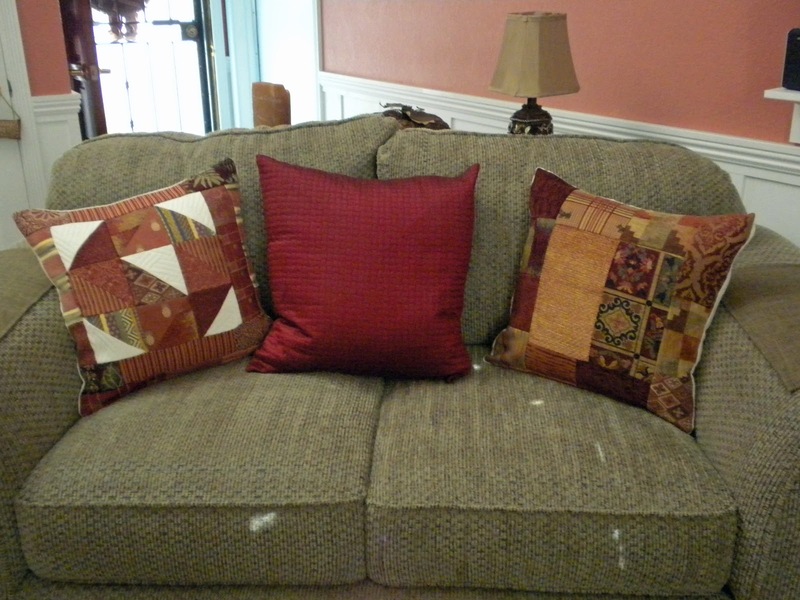 This loveseat is actually a twin sleeper sofa, but we rarely use it. 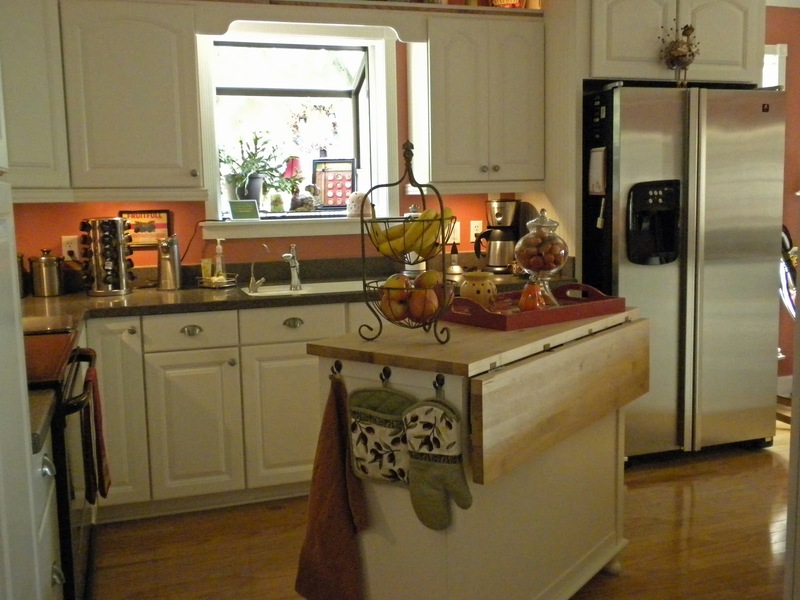 It just happens to be very comfortable & is the appropriate size for this space. 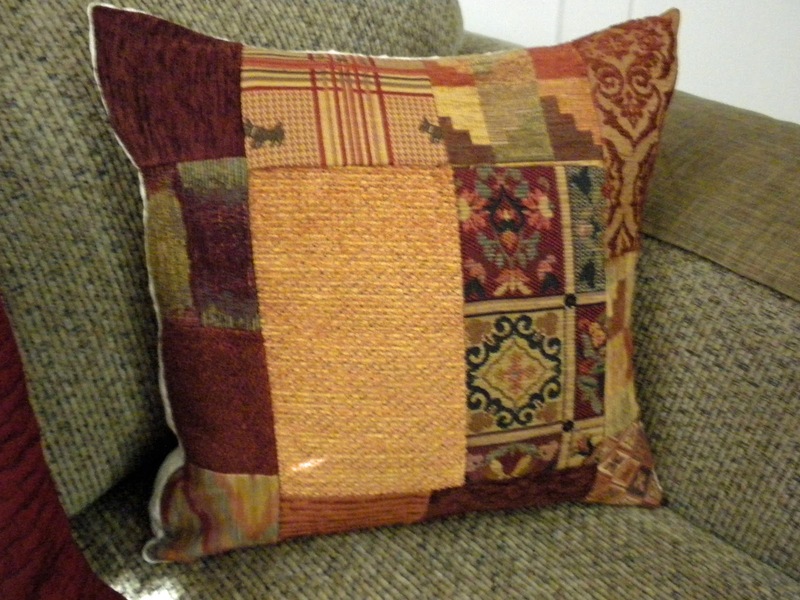 I have this thing for pillow covers & have made several sets over the years. The two end cushions I made using the sample display books that fabric stores carry. They are all very heavy tapestry fabrics & I just patch-worked them together to the size I wanted. I love the colors & how they turned out. My favorite quilt shop had a huge bin of these sample books that they were just giving away. Yay for me! FYI -- those aren't spots on the sofa but sunlight peaking through the shutters. Changes are adrift on the wind. Hey everyone! When I say changes are adrift on the wind, I mean literally. We are having incredible winds today & along with it, much cooler temps. Yay, it really feels like Fall. As I was getting dressed this morning, I realized it was actually cool enough for a long-sleeved shirt & pants that came all the way to my feet. This is quite thrilling to me, since having more of my fluffy/squishiness covered up is much more within my comfort zone. When I finally sat down to check on my blog, the first thing I noticed was my profile pic. Well, to be honest with you, that one was about four years old, so I decided to update (or maybe age-date) & let you meet me today. I had a lot of fun with PhotoBooth & then did some tweaking in PhotoShop (but not that much, really). I have to say, it used to be very hard for me to show myself wearing glasses (too vain I guess); but a couple of years ago, I had just had it with the contacts & forced myself to get comfortable with the "specs". Now I wonder why I let my silliness keep me from being comfortable & actually seeing so much better than I ever did before. We certainly have some strange hangups as women, don't we? At least I do. I haven't had time to do any tablescaping or re-arranging anything. Lots of other things going on. 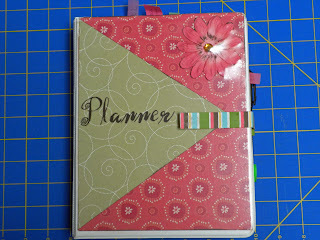 My Little Holiday Book is my constant companion these days as I maneuver through my list of projects. Spent the last couple of days cutting out quilts, wall hangings & table-runners, which I will be happy to share photos of when they are finished. My mind starts running at warp-speed this time of year & there just isn't enough time in the day to do everything I want to do. How about all of you, my dear blog-sisters? Do you do lots of handmade gifts, baking, decorating? I'd love to hear how you handle the holiday fun and chaos. Please share. Thanks for stopping by & please come back again soon. Can you stand another organizing idea? 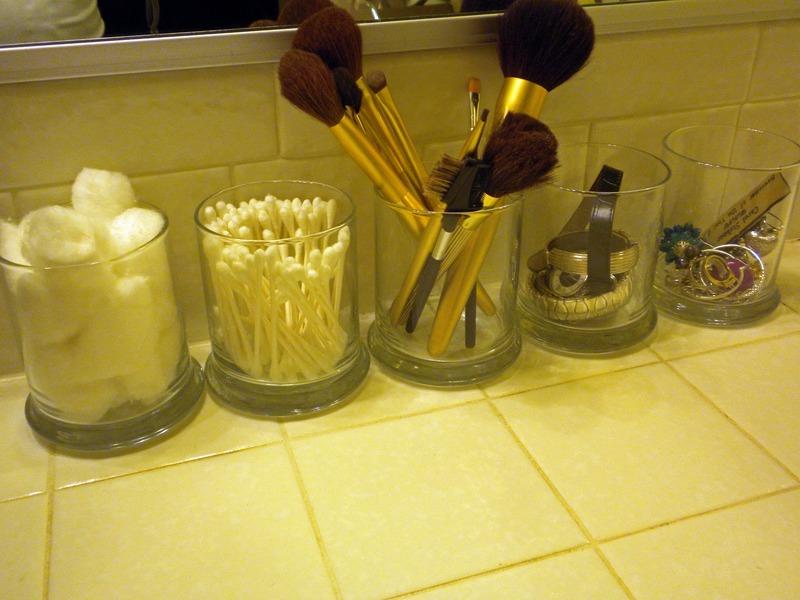 You may be growing weary of my sometimes quirky organizing ideas, but this one was kind of by request. 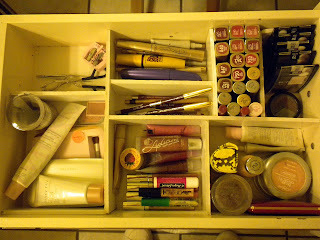 I was poking around in blogland a couple of days ago and Carmie of The Single Nester http://www.thesinglenester.com/2010/10/makeup-organization.html, caught my attention with her makeup organization. I won't say I'm a makeup nut, but I do like makeup & use it every day, so I like it organized. Her idea was great, but I have a very small master bath (yep, it's a one sinker) & her storage container would have been too large for my available storage. I mentioned that I had contained mine into a single drawer a couple of years ago & was still happy with my organized drawer system. She asked if she could see it, & crazy blog sister that I am, I'm going to "assume" that some of the rest of you might like it as well. 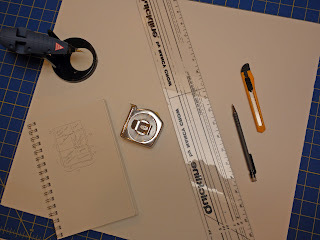 I had to recreate the befores & my construction process since I hadn't thought to take pictures (who would have thought I'd be blogging, not me). Yeah, messing up my drawer -- that's how much I love ya! Okay this picture is approximately how messy it was before; well, it was probably a lot messier. 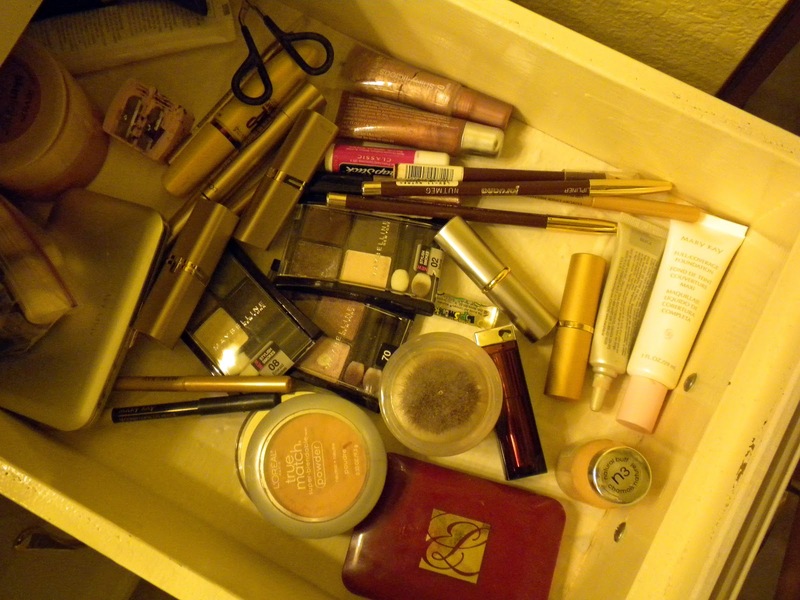 Seriously, I'm not a high-end makeup person. I get most things at Walmart. What can I say? I actually got the idea for doing this to my makeup drawer because I had created something similar in my play room for some craft supplies. I start most any project with a sketch of some kind. I laid out my makeup items (man, did I ever do some tossing during this process) & put them in groups & measured. Sounds rather tedious as I write about it, but it was really simple. Essentially what you are creating is an insert with the foam board. It doesn't need exterior sides, just the interior dividers. With my measurements at hand, I cut the board pieces & started gluing. This stuff dries very quickly, so it didn't take long at all. 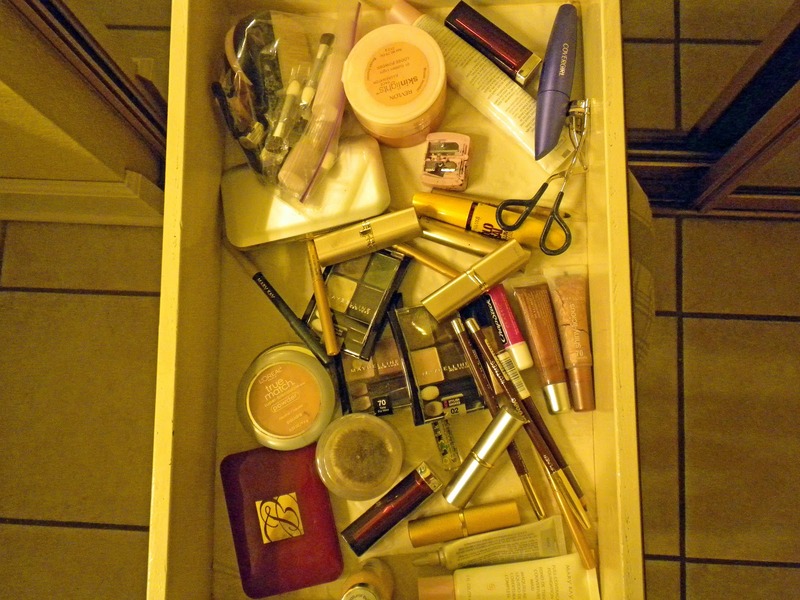 The end result made it possible to have a makeup drawer that looks like this photo. Totally works for me. For makeup brushes, q-tips, cotton balls, etc., I found these simple glass containers at the DS. Well, there you go. Now you've seen inside the drawer that lets magic happen. Hope this is of help to a few of you, anyway. Maybe sometime I will show you how I organize my clothes closet. Woopie, I bet you can't wait for that one! Thanks for stopping by. Please come again soon. 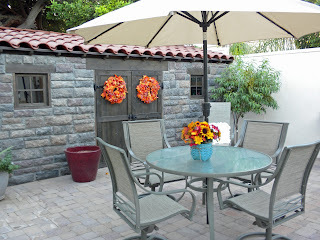 When we have even a slight cool down here in Arizona, I start pulling out our favorite recipes for soups, stews & chili. The current cool down is into the 80's, which isn't cool to most; but when you've lived through the summer here & experience 115 or higher, 80 requires a sweater! Anyway, I love cooking all the time, but more so in the fall & winter. This recipe has become one of our favorites & I can't remember where I got it. I guess I've tweaked it enough that I can probably call it my own. You can make your favorite recipe for beef meatballs if you like, but I use frozen turkey meatballs that I get from Costco. FYI -- I use turkey in place of beef almost exclusively. For this recipe, I use 3 meatballs per serving, but for heartier eaters, you might want to add a few more. Cook as directed above or until parsnips are tender. Gently stir into slow cooker. Cook until thickened, 5 minutes. My Southern upbringing comes out when I make something like this & I have to make cornbread to go with. This is a super easy and healthy meal. Hope you give it a try. It smells so good while it's cooking. Thanks for stopping by, & I hope you come back soon. 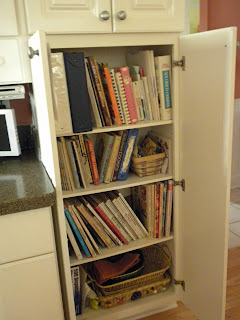 When I started this blog a couple of weeks ago, one thing that I mentioned that I really wanted to do is to share organizing ideas. There were some really nice comments regarding My Little Holiday Book, so I decided it was time to share some more of my "quirky" but time-saving ideas. 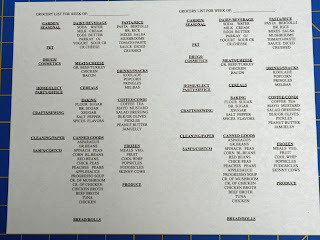 Something that I've been doing for years, even though we haven't had children at home for a long time, is meal planning & a detailed grocery list. Recently I added a Shopping/Errands list that has been invaluable. I was planning to share these 2 lists with you in a "rtf" format that you could copy if you wanted, but haven't been able to do that. If after looking at the photos & hearing my explanation, you would like to have these 2 forms to update to your own specifications, I think I could successfully email them to you. Maybe just showing a couple of photos of them, might inspire you to put one together on your computer that would totally reflect where & how you shop. Here are pics of these 2 lists. I have sized mine to fit my daytimer which is 5 x 8 1/2 (this allows me to get 2 forms per page landscape style). 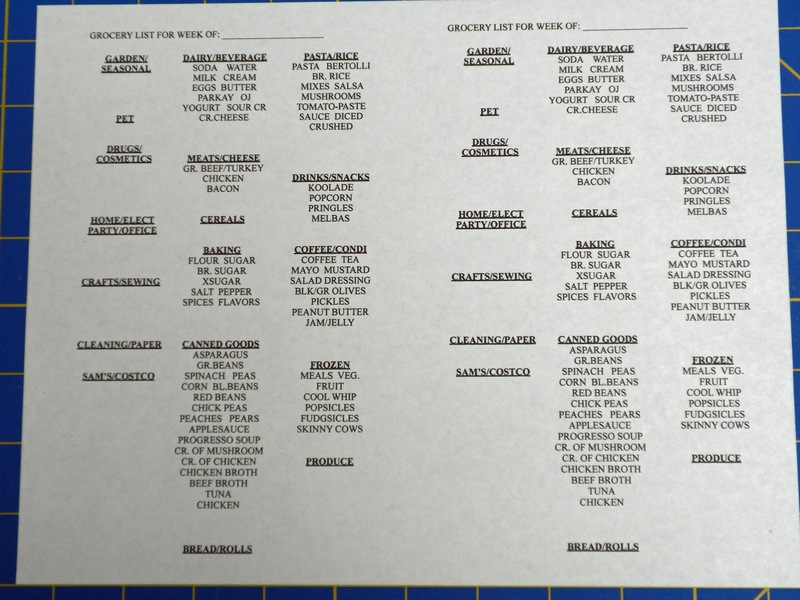 I simply print these 2 lists back-to-back, make a bunch of copies, then cut them apart & punch holes. 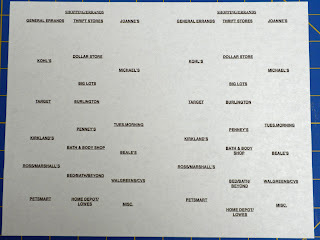 If you are more techno-minded, this could easily be left on your computer & just printed out when you are ready to go shopping. My grocery store of choice is Walmart, because we have 3 Super Centers in our town & they have started carrying more organic & healthier choice items that we like. 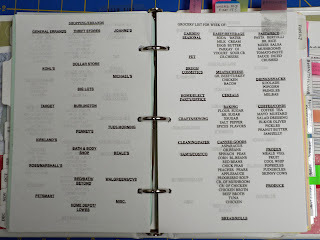 My list reflects how items are grouped in the store, rather than aisle-by-aisle which could change too often. As you can see, I've pre-printed quite a few items in each category that I purchase on a regular basis, so I can just circle those & still have space to add any extras. Doing this really helps me to not forget things; because as much as I enjoy cooking, I do not enjoy shopping for the food. 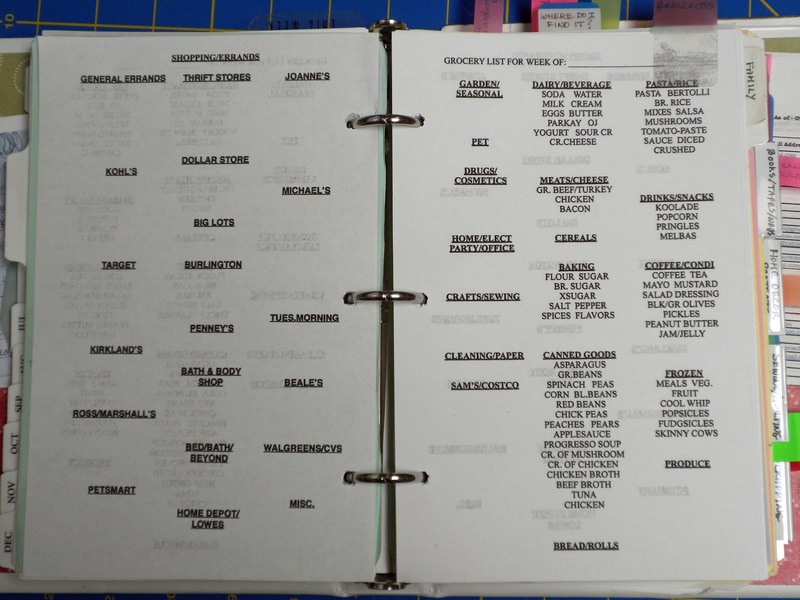 I plan menus for 2 weeks at a time and only shop every two weeks. Of course, I have to go back one extra time to get additional fresh produce, but that can be a super quick trip. My list fits on this little clipboard & I've taped on an envelope for coupons. I have tried over the years to go paperless, but I just like jotting things down or being able to add a little sketch of something I might want to look for when I'm shopping. 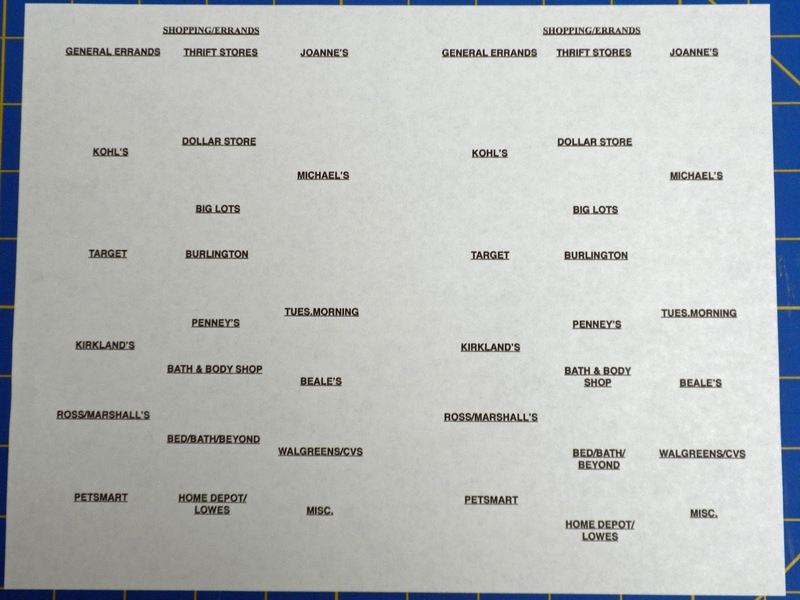 As for the Shopping/Errands List, I have listed every store in our town that I might ever shop in & tried to leave plenty of room for scratching off & adding to it. As you can see, I've given Joanne's & Michael's extra space! The key to making the list work for you is to remember to take it with you. After I've finished my grocery shopping for the 2-week period, I may or may not carry the clipboard for any other shopping. 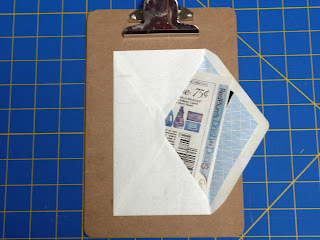 I usually just fold up my list, paper clip any coupons for my favorite stores onto the list & tuck it into my purse. Again, I realize a lot of you are much more into the current technology than I am & this may seem ridiculously simplistic. I agree, it is super simple but it works for me & might just work for you. I would be very happy to email one or both lists to anyone who wants them. Please email your request to: castebner@aol.com & specify which list you want. I'll try to check often & get them sent to you. 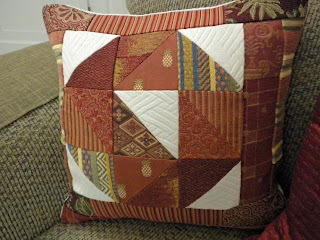 Now I'm off to start the cutting process of quilts I'm making for 2 of my grandchildren for Christmas. Thank you for stopping by & come back soon. Cook ground turkey (or beef), onions, & garlic until meat is browned. Drain off fat. Add meat mixture & all the rest of ingredients to a slow cooker & allow to cook at least 4 hours on medium heat or all day on low heat. Makes 8 to 12 servings. I like to put this into the slow cooker in the morning, set it on a low heat, & allow it to cook all day. The aroma is wonderful. I like to serve this with cornbread & grate some cheese over the top of each serving. If you don't have a large family, this chili freezes very well. The Man & I are pretty casual around here most of the time and most often have our evening meal right here at the eating bar. I always use placemats & cloth napkins -- we aren't totally lacking in class! I have been collecting the new Fiestaware china for a few years now. 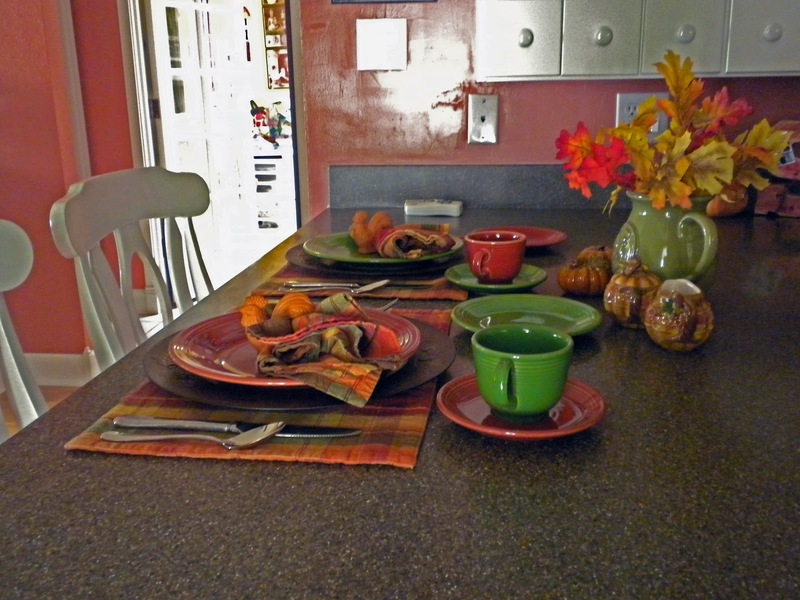 I have a place setting in almost every color -- that would be about 20 right now. 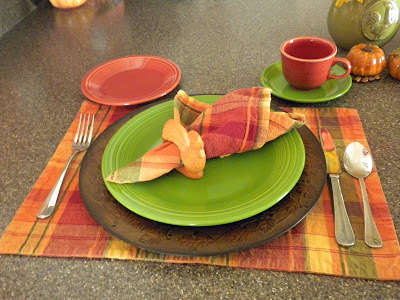 I've chosen placemats that combine lots of the colors of the china which then makes it really fun and easy to combine sets for my table settings. This is one of my favorites right now for this time of year. I've used Paprika & Shamrock. Don't they look amazing together? The cute green pitcher was purchased for a song at Ross. Also got the salt/pepper shakers there. The cream/sugar are from Tuesday Morning. Sorry about the glare against the back wall. There is a tall skinny window right behind me as I'm taking this pic & it's that bright Arizona sunshine making its presence known. 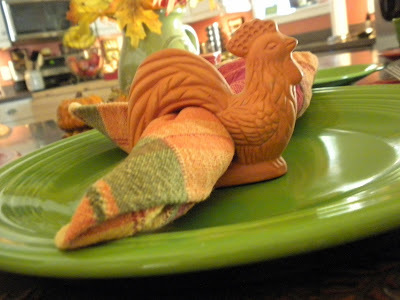 I got the chargers at Walmart & I've had the little terra cotta rooster napkin rings forever. It's not fancy, but at least we are paperless! Just as a side note, I have to mention how I took this last photo. 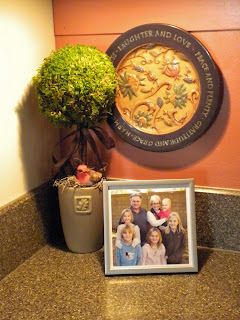 This was a photo challenge a few weeks ago from another blog sister, Becky Higgins (she's listed under My Blog List). She suggested simply putting your camera down on a flat surface & snapping away. You can do it on a table, the floor, the sidewalk--just to get a whole different perspective of things. I've gotten some super cool photos doing this. Give it a try. Well, I shared that we spent most of last weekend cleaning up the yard and getting our outdoor spaces ready for our season of outdoor living. We are actually expecting a cool-down into the 80's this weekend & hopefully no more triple digits until next June. The first 2 pics are some before shots. 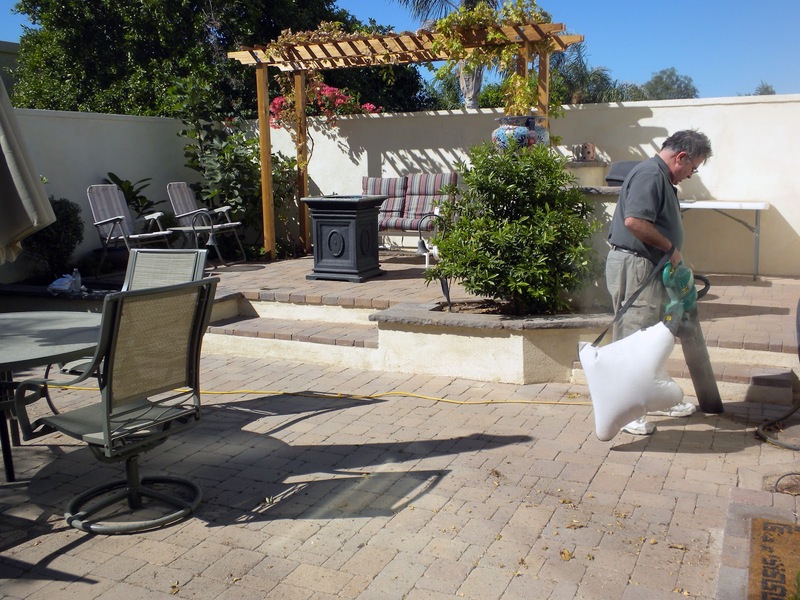 The first is The Man running his outdoor vacuum which works great on the pavers. You might not be able to tell, but everything is covered in very fine sand & is just very dirty. Even the fountain has been quiet for the last several months due to the heat. It's not practical to run it when we can't even be out there or have the doors open so we can hear it. Ahh, finally able to open the umbrella without choking on dust. Still lots of work to do in the form of planting, but it's getting there. Our space is really quite small, but The Man designed it with different levels & that makes it feel & work like a much larger space. 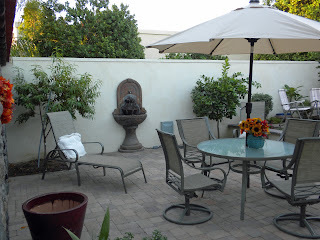 He built the pergola & has grapes growing up both sides. That is also where we have our fire pit (it's not really a pit, so whatever you want to call it), an old glider that's so comfy for chilling out with a glass of wine, & a couple of old chairs that need to be replaced. 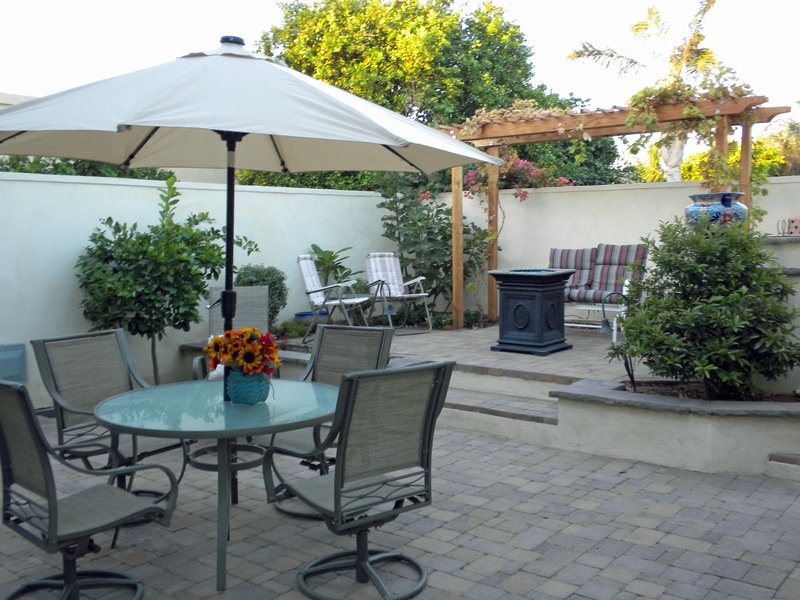 Next to this area & another step up is our outdoor kitchen (well, it will eventually be an outdoor kitchen). This was my spring/summer flower basket for the table. It has a makeover in it's future. I love turquoise, so I have become quite handy with spray paint. I do really like this color with all the colors of fall. Okay, even though we still have lots more planting & other things to do, it definitely has a more welcoming look now. The fountain has been cleaned, filled & is now providing that tranquil sound of gurgling water. 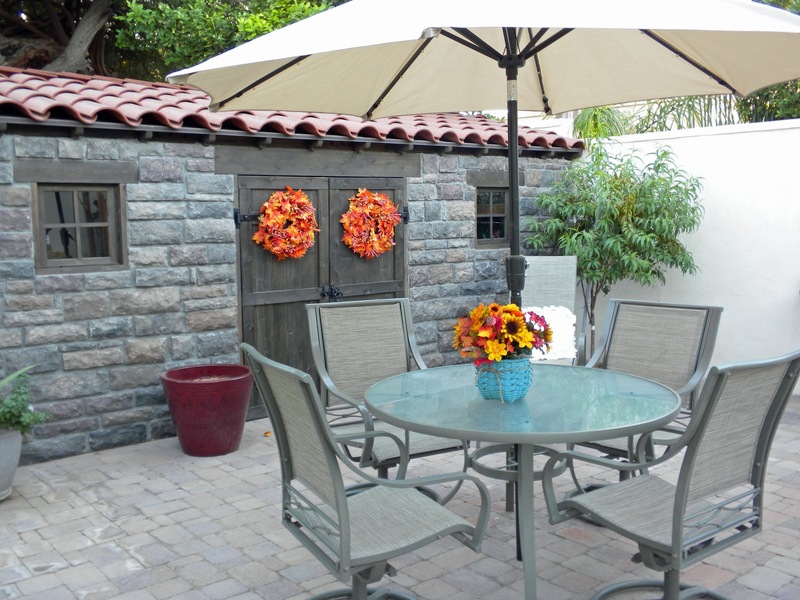 Never grow tired of looking at this garden shed that The Man designed & built. There are lights inside, so at night it makes me think of Hansel & Gretel, but no wicked witch lives here! This area needs lots more work, but I had to show it because of little Miss Abby. 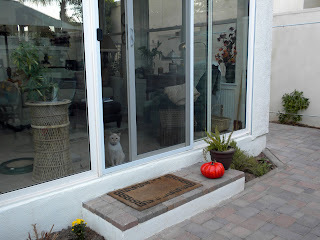 This door goes into our sunroom which is her favorite hangout unless we are in the backyard. She does not go outside at all, but will sit wistfully looking & giving the occasional "guilt-trip" meow in an attempt to make us change our mind. Not happening! Hope you've enjoyed the tour. You can stop by any time. 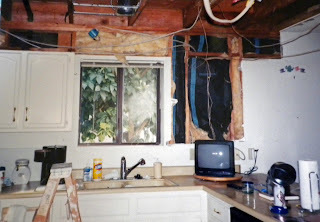 We bought our townhouse in 1995 & immediately started updating & remodeling as we could afford it. 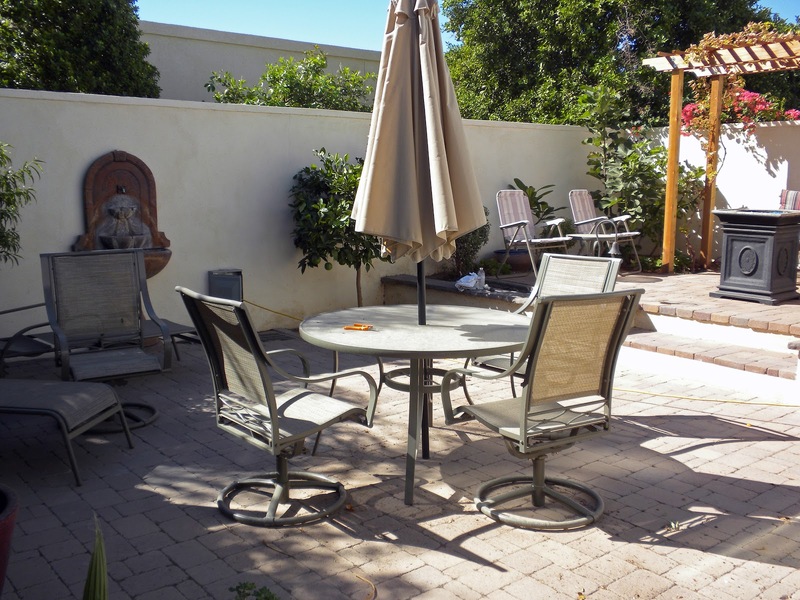 We did mostly cosmetic things in the first few years until we started to see some rise in property values in our area. 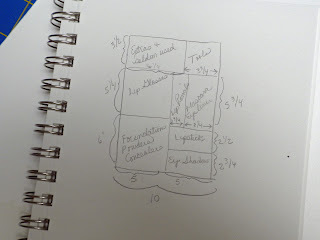 We had been talking about remodeling the kitchen for quite some time & The Man kept drawing plans & trying to plan what would be the most cost effective and value-added things to do. I really had started to resign myself to just living with this pretty disgusting (but not horrible) kitchen with its shabby chic cabinets (they were originally dark & we painted them a cream color), gold formica counter tops, & harvest gold appliances (do you remember that color?). Oh, lest I forget, it also had the dropped ceiling with fluorescent lights. Finally in 2004, The Man was ready to bite the bullet & get things rolling on a major remodel. 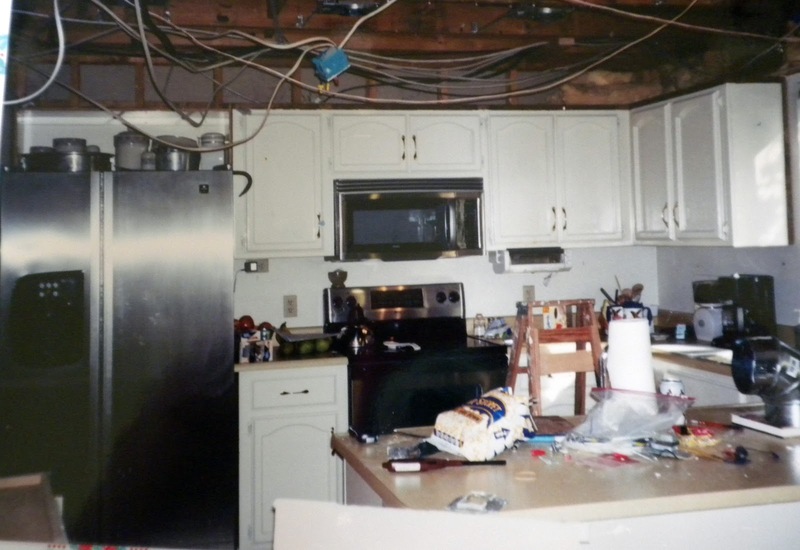 We had come up with a great plan which entailed reconfiguring the layout of the kitchen, so we really had to gut the entire space. I only have 2 photos of what it was like when we first started the tear out process. Sorry, these are digitals of existing snapshots, so not great quality. And yes, I was still preparing meals in this chaos! It took about 2+ months to get it all finished & there is not one thing that we would have changed. 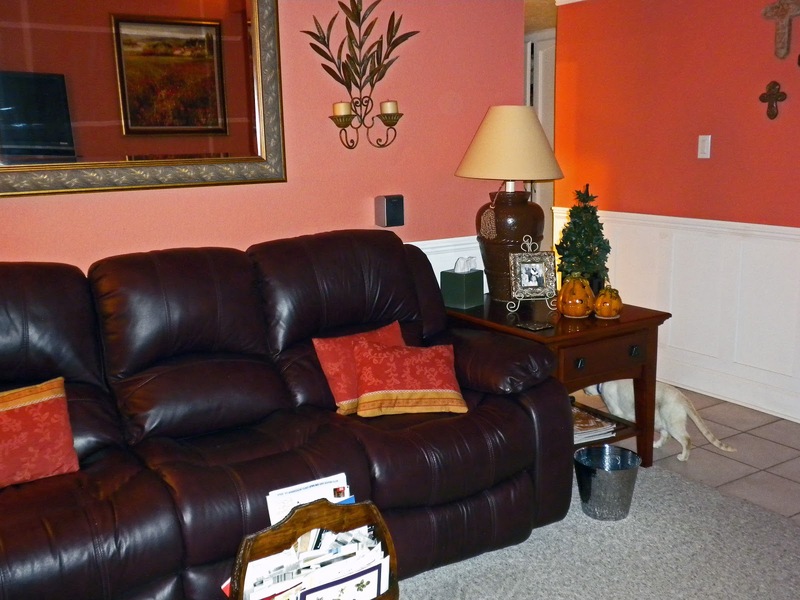 Even now, almost 6 years later, I walk into this lovely room & can hardly believe its mine. 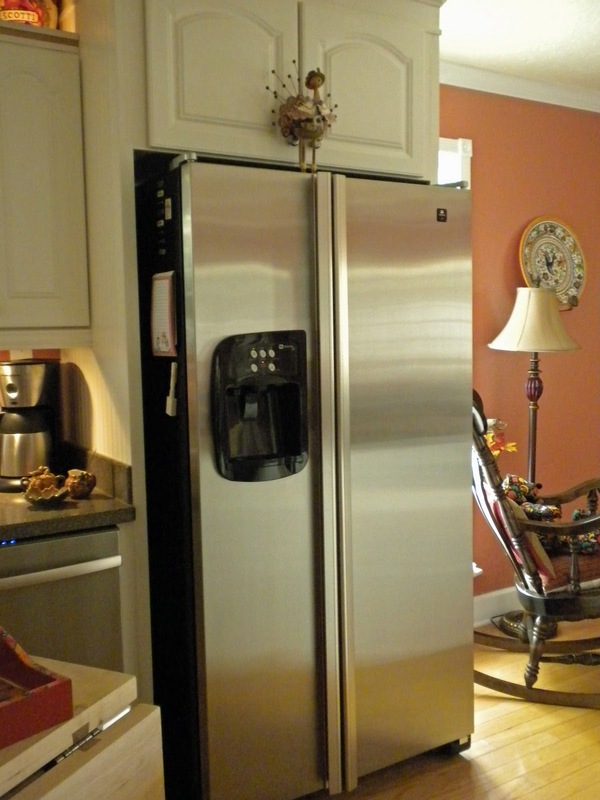 I will start the tour in the spot where the refrigerator is in the above top photo & kind of work around clockwise as much as possible. 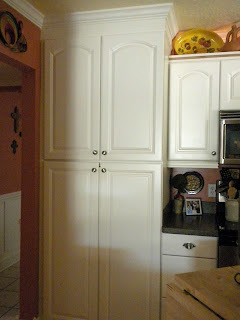 My lovely pantry replaced the refrigerator & is what you will see first. I love it so much, I'll even open the doors so you can see inside. 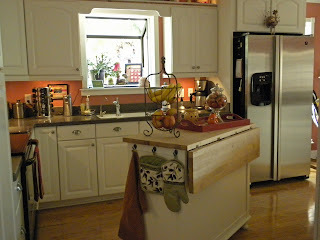 The shelves all roll out -- love that! I just love this little vignette. 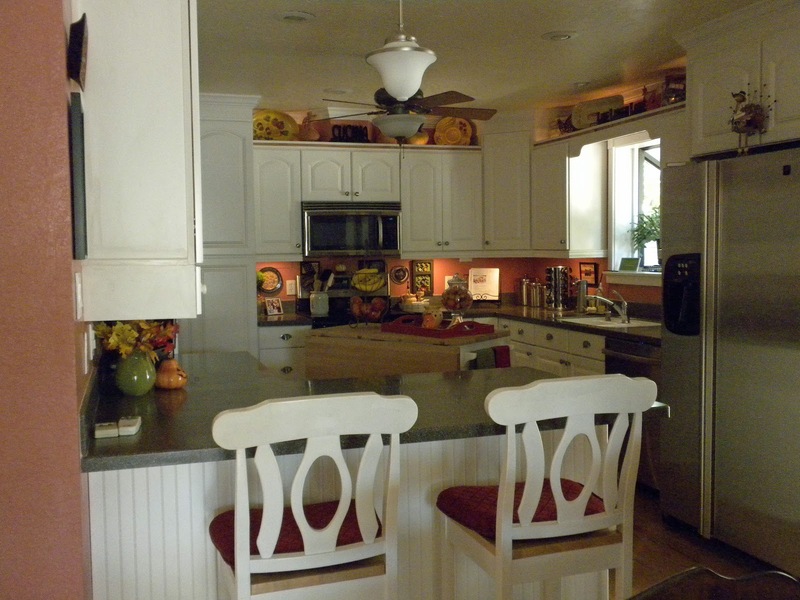 I kind of had to do a little arm-twisting to get The Man okay with the white cabinets, Corian counters (called Maui), stainless appliances, & oak flooring(light honey color). But guess what, he absolutely loves it. 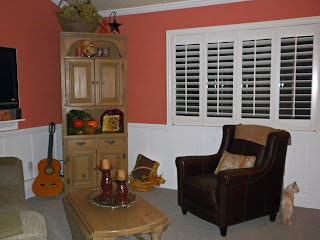 We decided on the Terra Cotta paint color because we have it in the living room & it's just so striking. We plan to eventually do some kind of tile or tin backsplash. Everything in good time, right? I love the solid surface sink with one side extra large & deep. 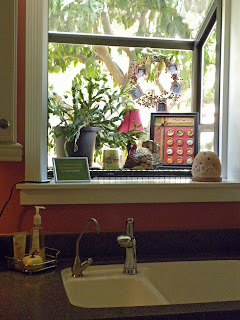 The tree just outside the garden window is a tangelo. 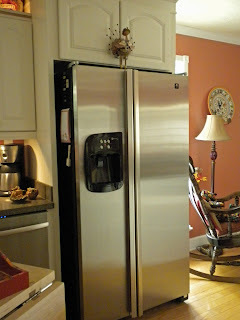 By reconfiguring the space, we were able to accommodate this very large refrigerator, finally have a pantry & increase the overall area of the kitchen by several feet. The Man is so smart! 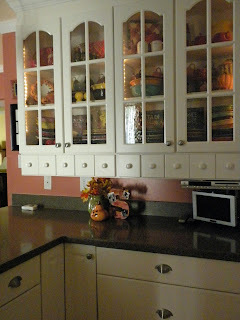 We did seeded glass in these cupboards & this is where I have my collection of Fiestaware, which are our every day dishes. The small drawers below do open & hold all kinds of little odds & ends. Love the little T.V. 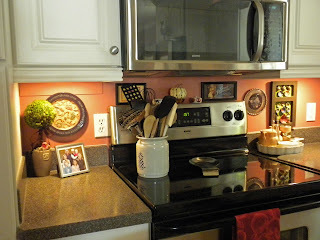 which swivels, so it can be seen from anywhere in the kitchen. 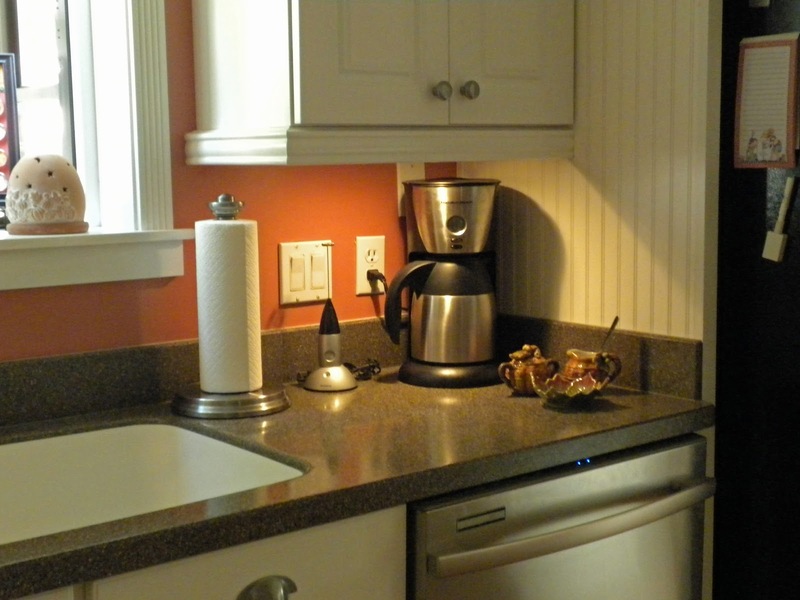 We put tons of lights in this kitchen because the old kitchen had so few. The Man put rope lights inside the glass-front cabinets, lights above the cabinets in my display area, lights under the upper cabinets, pot lights in all the major zones, the fan-light & the pendant. 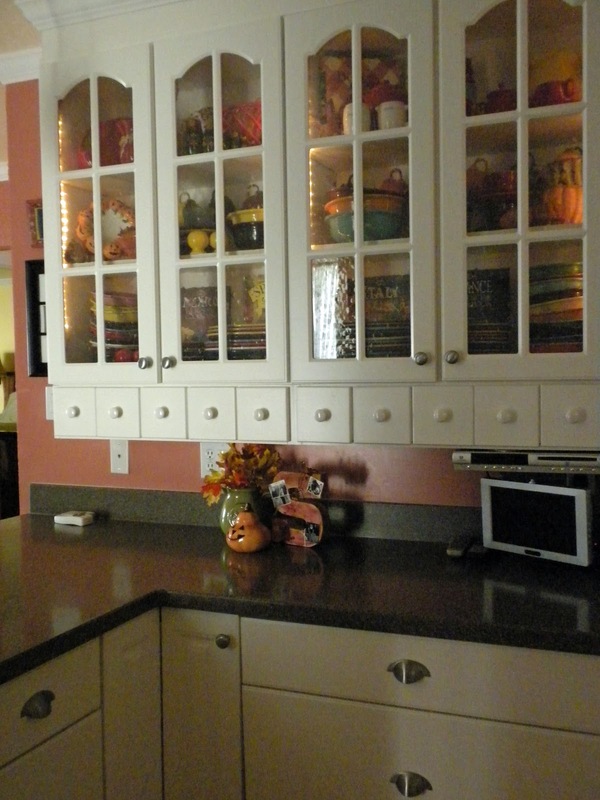 There are switches for everything & you can create such wonderful ambiance. We actually added the island a few months after the kitchen was finished. We wanted to make sure there was enough room & there was. 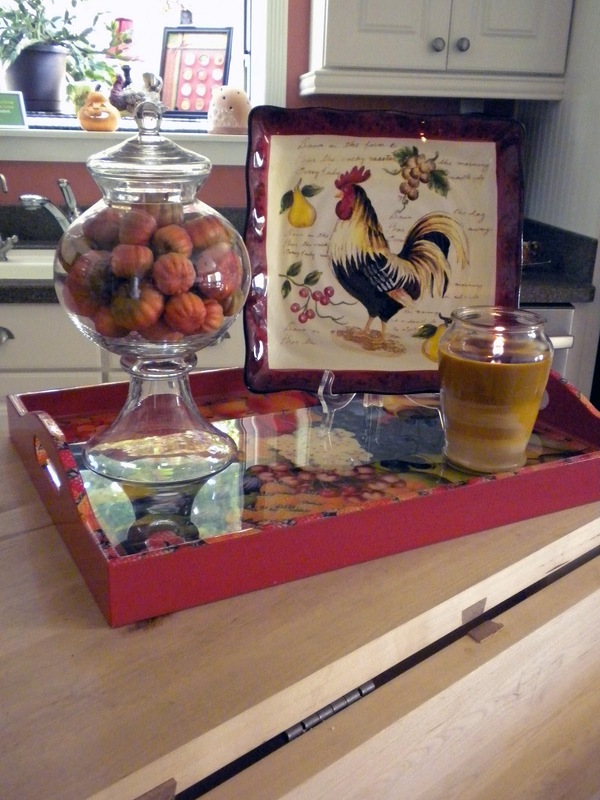 We found this one at Crate 'N Barrel & it looks like it was made for our kitchen. I love the fact that I can move it around (added pads to the bun feet). My fav is the angle it is sitting right now. 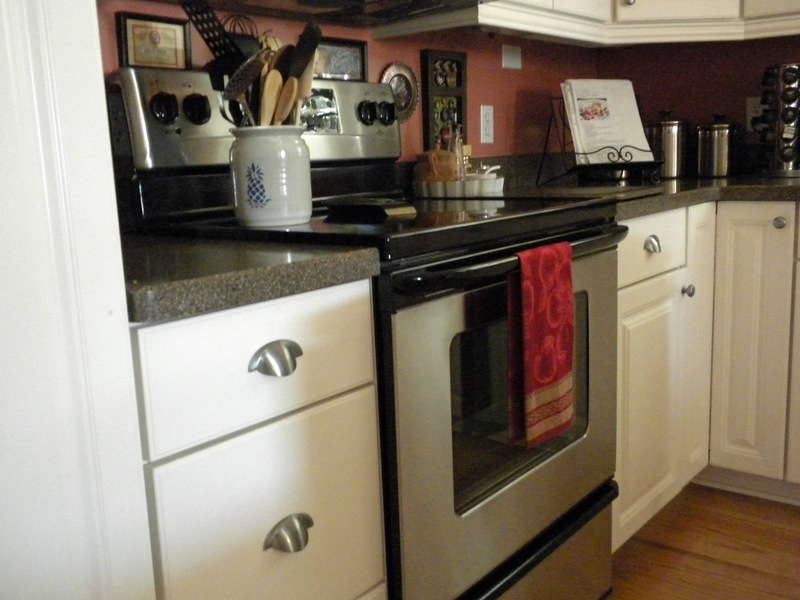 There is a large cabinet & drawers on the other side (forgot to take a pic). This is a floor to ceiling cupboard right next to the glass front cabinets. 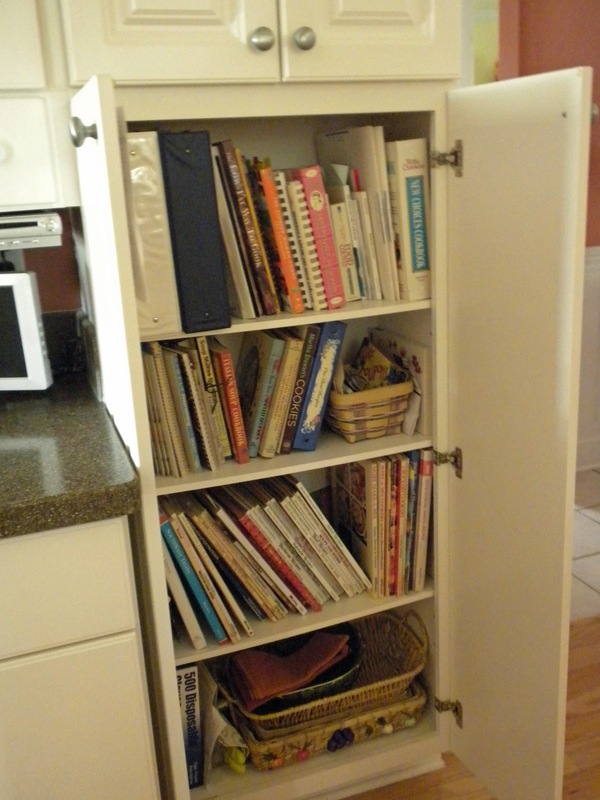 The bottom is where I store a large selection of cookbooks, & yes, I use them and love to cook. 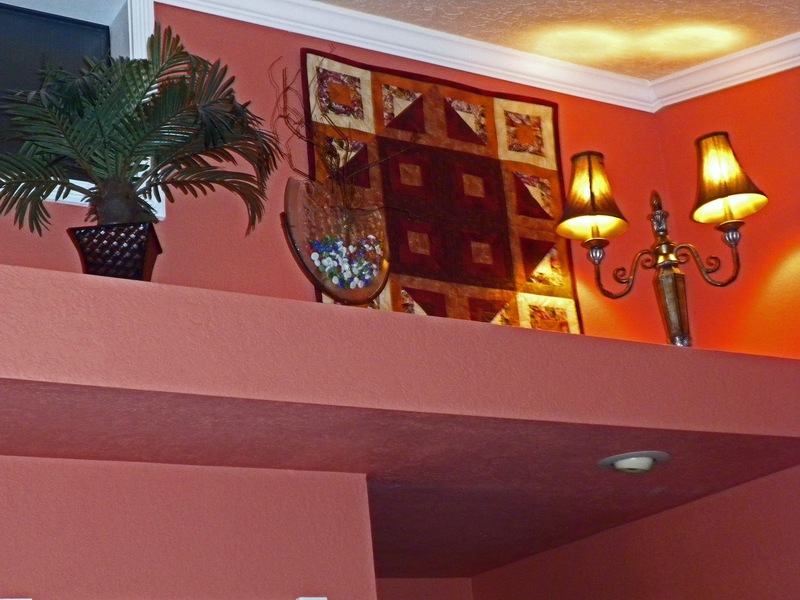 The upper area is where we keep medicines, vitamins & things the small grandchildren shouldn't get into. This is looking from the kitchen into the dining room & the sunroom beyond. That's why there is such a glare. 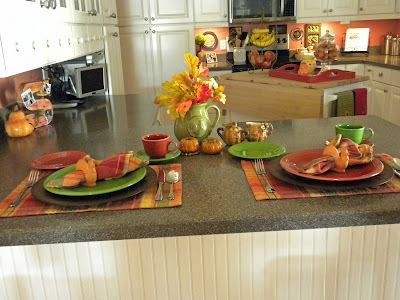 Thank you so much for allowing me to show you around my kitchen. It's not grand by most standards, but it has been a labor of love. 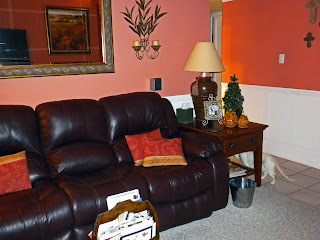 I strive very hard to have all areas of our home be as warm & inviting as possible. 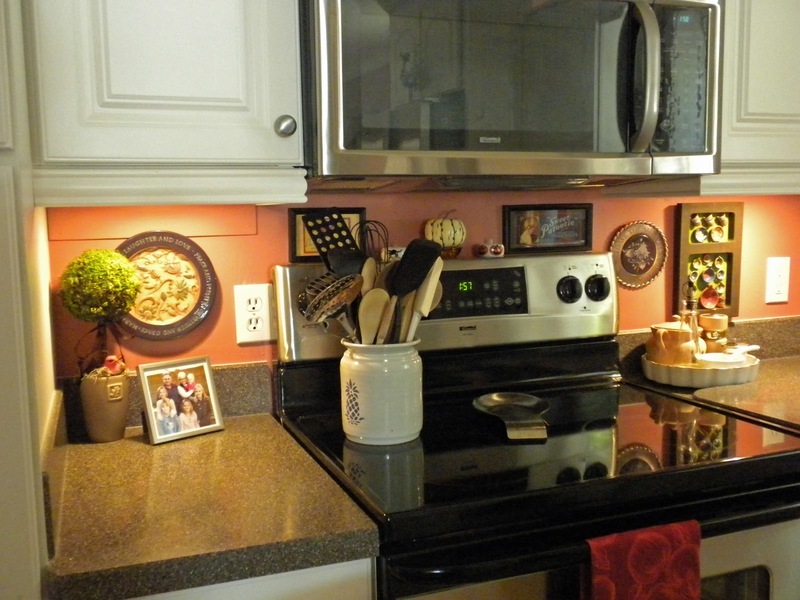 Our kitchen is no exception. I love having friends and family sit at the bar or the table sipping a glass of wine or a cup of coffee, while I whip up something yummy to eat. 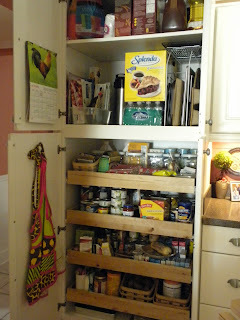 My pantry is usually ready for the unexpected, so stop for a visit some time. Have a Happy 3-Day Weekend!